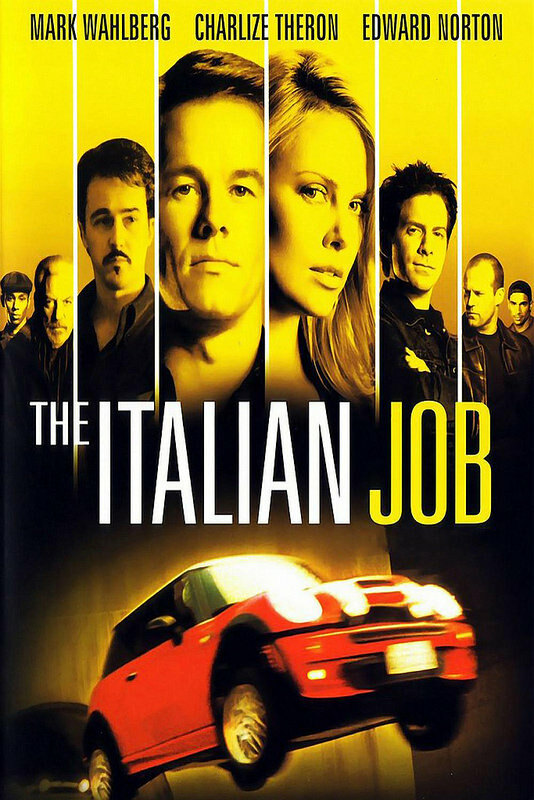 The Italian Job is one of those movies that you are unlikely to have heard of despite being familiar with the heist genre. It even has some big actors but I still don’t remember it making any headlines. I guess it probably just came out at a tough year. Still, it’s a pretty solid film that may not be amazing but manages to avoid making any really serious mistakes which is important. The film starts with a group of burgers pulling off a pretty big heist where they had to race the cops in a boat and got to walk away with millions. Unfortunately just as one of the characters was finally going to retire, the group was betrayed by Steve who decided to keep the money for himself. He shots the best crook, drowns the others, and then runs off. Years have passed and now the burglars want their revenge and also hope to secure the money in the process. They managed to survive with their wit and have stayed under the radar for a long time. It has all been for this one moment but to make sure that this mission is a success they will need to bring in a secret weapon, the daughter of the dead burglar. You will have to turn your suspension of disbelief on full blast right away here as the plans are so detailed and convoluted that you probably won’t be able to accept what is happening with a straight face otherwise. In the climax of the film the villain gets a helicopter and even a private militia as he drives through town but the main character, Charlie is able to hold his own on a quick motorcycle. His team of quirky hackers seem more than capable of taking any villain down after this film. Where the film really did a good job was with the fast moving plot. A lot of things were always happening. The talking scenes are pretty engaging and I do tend to enjoy the planning. The execution is also on point and it’s just a solid film from start to finish. The ending was also really good. One thing that tends to happen in a film like this is that the heroes will win it, but the villains end up destroying all of the informants along the way thereby preventing anyone else from ever replicating the feat. I was worried for “Tiny” or “Slim” (I forgot which one was his name) when the villains showed up at his door. Fortunately it turned out all right for the guy and in the end everything worked out. It’s also rare for a villain to not get away with murdering random Jim #34 but in this case it’s one of the main things that comes back to bite him. Turns out that this guy was friends with the mafia and you don’t mess with those guys. The cast of characters was also surprisingly good which is always important. Charlie is a great tactician which is shown from the start. He may not be infallible but is able to adjust his plan at a second’s notice to fix any oversights. Even by the end he was one step ahead of Steve and never found himself at the back. Steve is also pretty solid as he always talks with a lot of confidence and has a smug air about him. Definitely not a guy who gives up easy and even if he isn’t as smart as the main character he isn’t half bad at making plans. Against someone else he may have stood a chance. Of course, he definitely should have sold the gold by the time the heroes found him though and shooting the merchant just delayed this even further. Not the smartest villain around even if he is fun. Stella is solid as well. Initially I forgot about her first appearance and for a second thought that the film was bringing in a new character. The opening does certainly make more sense in light of this. Unfortunately, her character is used for fanservice quite a bit as we have the unfortunate trope of someone walking into her room while she is still getting changed. Likewise, Stella’s entire first scene seems to be focused on her attire more than the actual dialogue. Once we get past these moments this fortunately stops happening. Stella is a solid locksmith even if she is not quite at the same level as her father yet. She can also drive with the best of them. I think her character could have been handled better but overall she was a good character. Another one of the thieves was the Napster. This guy spends most of his time complaining about how Steve stole his inventions. He takes this the least seriously compared to the rest of the team and nearly blows there cover several times by pulling pranks on the cops and the government. So much for being discreet right? I suppose he has his own priorities so you can’t really argue with that. He’s definitely a pretty bad character though. There is also Gilligan who does his best to mess up everyone’s chances as well. When it comes time to broker a deal with someone who has the supplies they need, he can’t help but stare at the guy constantly even when he is told not too. Actually, as far as the great character cast maybe I should be more specific. Steve, Charlie, Stella, and the father from the very beginning are solid characters. Everyone else definitely has a lot of room for improvement if you ask me. Still, since the characters with the most screen time are at the top that’s what counts. We also get a long car chase scene that I referenced earlier and works well as the climax. Who doesn’t like a good car chase right? After a while they may all start to seem like the same race if you watch enough films, but that doesn’t take away from the fact that they work quite well as a satisfying way to end the film. It’s not as if we could have had a real hand to hand fight at the end as you would have then had to ask where they learned how to fight. A battle of two self taught fighters could be fun, but I don’t believe Steve ever would have bothered learning how to fight while Charlie showed earlier that he could throw a good punch. Overall, The Italian Job is a pretty fun heist film. The pacing is always on point and the characters make for some pretty enjoyable banter. Some of the plans may seem like a stretch at times but that goes hand in hand with the genre. If you like watching a game of mental chess going on with plans and counter plans then I’d recommend checking this film out. It’ll keep you entertained the whole way through and never really make any mistake big enough to get you out of the action. It’s satisfied with just being an entertaining film and that’s a pretty solid approach if you ask me. If you ignore the fact that Prime looks obviously evil in the poster…it’s hard to disagree with the message. If one planet is going to die then shouldn’t it be Earth? Those guys are always picking on the Autobots and destroying themselves anyway. Even if the Transformer movies have not been all that good historically they do certainly have great posters and trailers. If nothing else, they always do a good job of drawing you in. On that note, I went to the theaters to watch this latest installment, but could it hold its own against the last few and even surpass them? Time to find out! Well, the film starts off with a prolonged action scene back in the days of the 12 knights. It’s as boring as you’d expect with very generic bombs being thrown and people stabbing each other. Films like this one keep reminding me why action scenes should all take place in the modern day alongside big buildings and cool effects. The drunk Merlin gets the Autobots to help him so they destroy the other side. Merlin is even given the staff of power which has the ability to destroy and recreate whole planets. He literally takes it to the grave. We cut away to the present day where a girl by the name of Izabella is saving a few kids who broke into a government protected site with killer machines running around. They shoot to kill and that includes kids, but fortunately Cade and his resistance pals like Bumble Bee show up and finish off the government robots. The kids run off, but Izabella stays with Cade since she wants to fight. The two characters trade sob stories while Cade has a beer (The film made sure to show that it was a Budlight) and then Mr. Edmund shows up to tell the heroes that they have to find the scepter of power and stop the incoming invasion. He has also located and brought in a lady named Viviane who is a descendant of Merlin and the only one who can wield it. Naturally Viviane and Cade don’t get along, but none of the characters do. Can they at least stop the invasion or will their not so subtle insults against each other take top priority? Oh yeah, Megatron’s also around. This is 100% a Michael Bay film. You can tell because it follows all of the classic tropes. The only good one is that we get a ton of explosions. There’s constantly something catching fire and blowing up. Everyone gets to be in an explosion at some point or other and that was interesting. Well, interesting isn’t the right word, but at least it’s something to catch your attention even if you know that it’s just trying to cover up the lack of a plot. Unfortunately the other cliches are here. Naturally when Viviane is brought to the castle, she decided to bring along a rather inappropriate outfit for business. It’s not as if it would be a huge deal but of course Cade brings it up and they have a pretty sad conversation about it. Keep in mind that these two were enemies at first, but Cade quotes a random philosopher once they’re okay. He shows off his 6 pack once and they are immediately past the friend zone. The flirting and fanservice were pretty sad and while not as bad as in previous films, I had a feeling the film would bring this into the picture. Then there’s the writing. I don’t want to say it was the worst yet, but there must have been over 50-100 s words in the film. It was used in almost every single sentence. It’s as if the keyboard warriors from reddit and twitch were the main characters in this film. It was incredibly awful and took you out of the film every time. Why does everyone have to use swear words to express every idea that they get? It’s painfully bad and would have doomed the film to a low score even without all of the other negatives. It’s also hard to know who to root for. The Autobots are anything but likable. They spend the first half of the film doing more damage to each other than the Decepticons possibly could. Bumblebee even destroys one of his fellow Autobots for no good reason. I don’t remember his name but it was one of the minicons, Bumblebee just crushed him without remorse. The others don’t get along either so there’s a ton of threats among them. We get about 20 minutes of the Autobots just yelling at each other and the humans deciding to follow their example. The insults get pretty personal throughout and one guy even brings up the race card to counter Cade. Well, I shouldn’t say “even” that was another guarantee in this film. Viviane doesn’t get along with her parents and relatives either for more drama and they care more about her love life than the alien invasion. Edmund is constantly threatening to destroy his butler and his butler tries to choke Cade to death, but is stopped at the last second. These are our heroes. Think about that for a second. Our heroes are the ones who keep threatening each other, actually destroy one member, blackmail other members, and basically just live to destroy. They destroy Decepticons not for honor or victory, but just because they like to murder stuff. Optimus Prime isn’t exempt either as his terribly conceived plan to head to Cybertron winds up getting him frozen. Fortunately, he crash lands there and the ice chips off. I think he suffered a severe concussion though because he doesn’t remember that Cybertron was destroyed so he rushes over and attacks the metal lady who’s there because he thinks she destroyed it. She casually beats him in one hit with her lightning and forces him to kneel before her. She then easily mind controls him to turn evil and be her slave. It’s hinted that it’s mind control since he grew a red scar and she did the same to Megatron. Oh yeah, Megatron gets mind controlled so he’s a subordinate yet again. Prime doesn’t stay evil for long though as a quick “Martha!” sort of line gets him to turn good again. The heroes decide to kick him a few times while he’s down so he learns a lesson though and everyone just stands there and watches it happen. I get the feeling Prime isn’t too popular on Earth sometimes even if the Autobots claim that they look up to him. While Quintessa (The metal lady) was pretty awesome and it was nice to see her wreck everybody, the film forgot about that. Instead of blasting Viviane and ending the film in an instant, she orders Megatron to do it and doesn’t do anything herself. She gets blasted by Bee and that’s basically the end of her story. It’s a sad way to go. Hot Rod is actually in this film, but you’ll barely care since he’s nothing like his classic self. He’s just a guy with a french accent who likes blasting stuff. His time stop ability is useful, but he rarely ever remembers to use it so he may as well not have it. The Decepticons are all fairly generic. We have a scene inspired by the Suicide Squad where we see him release his favorite cons and they all team up, but half of them die in their first action scene and even Megatron himself isn’t all that impressive. He seems about as durable as your average con and has slightly more firepower. He never really seems like a threat. Despite the writing being so bad, some of the humans are all right. Izabella is reasonable for a kid. At least she knows what she is doing and managed to survive for so long as the government base. Her robot even looked a lot like Bumblebee and I could have sworn that it was him the whole time. Why do they have the same design? If Bumblebee had died in such a random way like that I’m sure the fanbase would have gone nuts though. I didn’t really care for Viviane much though. She seemed to overreact a lot and the 180 personality shift once she got along with Cade was sad. Cade also wasn’t that great as he drinks too much beer and also takes things too personally. The whole plot with his daughter was made to be way too dramatic. The government is also bad as always. They decided to turn against all of the Transformers yet again. Sure, they’re all pretty mean, but why pick a fight that you can’t win? Their weapons are finally strong enough….well who are we kidding. Their weapons are always strong enough to beat Transformers. They’ll still lose in the end if they go with a frontal assault so it’s just not a smart move. It’s a rather half baked one. The only good member of the army was the physics guy who kept mocking the heroes for relying on magic. He’d point out that magic wasn’t real and that the team should use physics to win. It didn’t work of course as magic is the whole point of the film, but the guy made some good points and had a lot of excellent burns. The film relies pretty heavily on being half comedy and action. Unfortunately, the humor doesn’t work very well. The funniest scenes were the unintentional ones like the heroes constantly bickering or Optimus Prime getting frozen just by flying. The actual humor just tends to fall flat like the flirting and all of the characters acting like jerks. I suspect the guy on the telephone trying to be a knight was supposed to be funny as well, but it didn’t really work. Also, how come this guy seems to know everything? I like that he didn’t panic like the others and just decided to hang out at the beach instead of stressing out, but it felt like filler. Of course, over half of the film is basically prolonged to extend the run time. I suppose there could be some charm in seeing the characters all insult each other in a reverse friendship kind of way. Perhaps Bay is going for that as you just enjoy all of the insults, but even that would need better writing. Bad writing holds everything back. Aside from the opening action sequence, the fight scenes aren’t bad I suppose. They all start to blend together after a while and we don’t really get any prolonged fight though. Most fights end with a few hits. 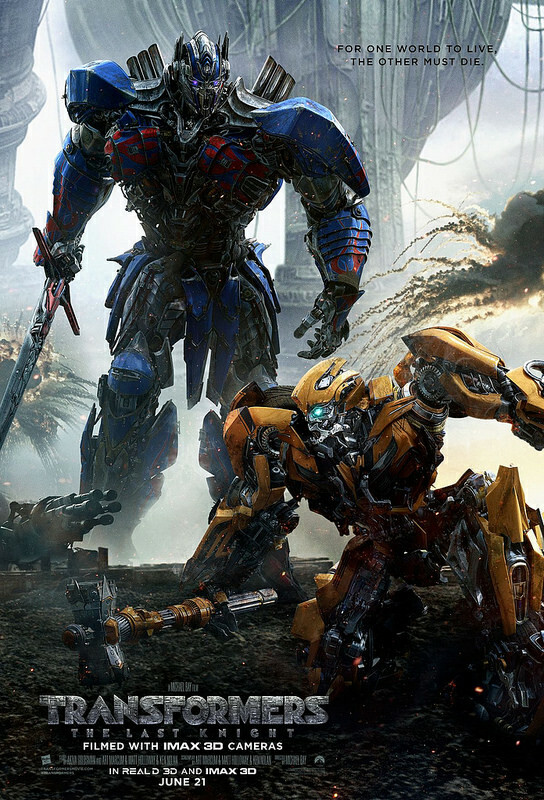 Bumblebee vs Optimus is probably the only really long fight in the movie and that would probably be the best one. The ending was rather anticlimactic though. This film does have an after credits scene by the way so you should stick around for that. It’s the kind of scene that would be hype in a different series but not for this one. The villain that they’re hyping up is not someone I want to see. I was practically wincing there because I assumed that by grabbing the scepter they had hopefully destroyed this person too. Ah well, at least the cool person who is giving out the intel should be a good villain. Perhaps that is all I can ask for. Overall, Transformers delivers another blunder. It’s just a bad film that is crammed in with every plot imaginable. The plots could have been good except the writing is terrible. The script is so bad it hurts and the characters are all made out to be villains or unlikable. The romance is as rushed as it ever was since the characters have only known each other for around a day or less. The film can be funny at times but for all the wrong reasons. There’s just no reason to have hope for another film, but they’re going to come out anyway. I like to think that the next film will be better, but it’s hard to even think that at this point. I suppose the films deliver on being mindless action blockbusters where you just try to enjoy the experience and keep it moving, but all of the films feel the same in that regard. They’ll hold your attention but never come close to being a good film. If the next film wants to be better, it should finally make the Autobots heroic, Strengthen the Dinobots a bit so they don’t keep losing, strengthen all of the Transformers so humans aren’t constantly beating them, and make the humans more likable. The films may just be doomed though and your best bet is looking at the original animated series again. At least that one was quality. Well, looks like it’s time to check out another one of the Ape films. I can’t say that I went in with high hopes after the first batch, but this is a reboot. With new directors comes new opportunities right? This one was a solid improvement over the last few as it managed to work on most of my big problems with it. That being said, it’s guaranteed to make you sleepy once you start watching it. Captain Leo is at his space station when the commander decides to send a chimp into space. Leo protests this, but the commander won’t listen. The chimp doesn’t know how to use the controls so it slowly starts to fade away into the silence of space. Leo won’t allow that to happen so he hops into a pod and chases the little guy. Both of them fall into a portal, which leads to the far future. Apes have enslaved humanity and they now rule the world. Can Leo lead the resistance away from the apes or are they all going to die? The plot is fairly similar to the first film, but with some improvements. For starters, Captain Leo is actually a likable character. He went after his monkey, which was the hero move and he was pretty cool about it. Unfortunately, he quickly starts to lose his edge once he is stranded on the foreign planet. Good things can’t last forever I suppose. He does stay defiant all the way through to the end though. He may not have been quite as tough as he was in the opening, but he is dealing with meta powerful apes so he has to be careful about how he operates. I dare the new films to think up a more likable character! I rarely mention actors, but it’s safe to say that the actor did a good job here. Now, the main thing that you are likely wondering about is the animal violence right? After all, that’s what utterly destroyed all of the other Ape films. Well, you’ll be happy to know that it was significantly reduced from the other films. I dare say that this one has the least amount of it although I remember one of the old films being decent about it. Perhaps my memory has started to fade a little sooner than usual. It’s not completely eliminated though and you’ll also feel bad for the horses that are caught up in these petty wars. 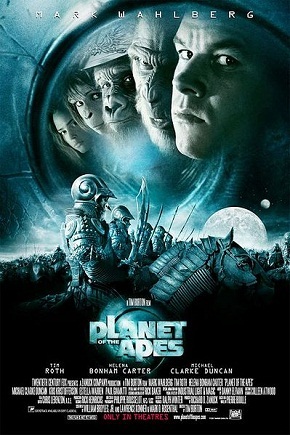 It’s a negative that is still around, but considering that this is a film about apes, Burton managed to take away as much of the animal violence as he could. One part of the plot that felt a little like a plot hole were the cave dwellers. In the first few scenes, it seemed like the humans could not talk. They may not want the apes to know that they can talk, but there’s no way that they couldn’t utter a “Huwahhhhhh” or “Gwagggg” as they were being taken away. At least a “Help” at one point would have sufficed. No, they seemed to be totally mindless until they randomly started talking towards the end of the film. I’ll assume that this part simply wasn’t thought about very much as the writers just wanted to go through the plot already. The ending is pretty epic. I love the concept although it could have been made even better. The film ending with Leo arriving on Earth where Birds have taken over the planet or something like that would have been cooler. As it stands, my take on the ending is that he’s in a parallel world. I don’t think he can be on the same Earth that he was in before because he is back in the past and yet things have not really changed. There’s no way that the past could have been altered from the future and the humans would have not lost so quickly and suddenly. It’s too bad that this didn’t get a sequel to surpass all my hopes and expectations…….or maybe it wasn’t. One of the main problems from this film is that it will make you incredibly sleepy. As you’re watching the characters drone on and on about things that don’t ultimately matter, you will feel your eyes start to get a little heavy. As you try to keep yourself awake, you’ll slowly start to sink into the pillow that you have on the arm rest of your chair. Slowly, but surely, you will eventually fall asleep and only wake up as the film is ending. Such is the fate of all who eventually watch this film…in theory. It’s simply not very exciting at all and that really hurts how much you can actually enjoy it. Also, you simply can’t save a bad concept no matter how good the execution is. Attack on Titan is an incredibly good example of this and I always love to use it. The anime played everything just about perfectly, but it still had to adapt the manga and that was the problem. No matter how likable they make Leo or how much they try to get rid of the animal violence, you simply can’t fix the film when it’s using this plot. There will always be some animal violence as long as the apes are the villains. There will always be the human enslavement plot that is not fun to watch because it’s part of the plot as well. That’s why the plot has always been known as a very important part to the film because it can destroy a film just as easily as it can make the title really cool. Well, we’re getting a lot closer to the latest Apes film continuity, which is supposed to be the best yet. I have my doubts as the trailers did not look very good, but I suppose that you never know when a film will end up surprising you right? I’ll likely be seeing them soon or at some point in the future and then you can count on a review. We’ll see if it ends up topping this one or fading away. Overall, Planet of The Apes really gave its all into making this film a success, but it simply didn’t work for me. I appreciate the effort though and the animal violence is noticeably reduced, but it’s simply not enough. Leo also had a great start as the main character and then he started to become more generic and less impressive. None of the apes are likable or interesting. You’ll really think that you’ve seen them before because they are all essentially cardboard cutouts of the original apes from the older films. We have the nice scientist/royalty member who wants to live in harmony with humans and her scared husband who is afraid for his life. Then there’s the main villain who wants to take control of the clan. Seriously, you’ve seen this all before so nothing is new on their side. There’s only so much that you can do with this plot after a while. If you want to see a film about creatures deciding to defeat humanity, I recommend watching Future Card Buddyfight 100. The monsters decide to take things into their own hands this time!